Clival chordomas are surgically very challenging tumors given their varying biological behavior, central location, and tendency to infiltrate bone. Given to their high recurrence rate, propensity for local invasion, and close relationship to important neurovascular structures, total removal is often challenging with the potential of significant postoperative morbidity. While there are no uniformly accepted guidelines, the current standard for their treatment includes safe, aggressive, maximal surgical removal followed by high-dose radiation therapy. An oncologic approach in their management is required. The clivus may be accessed through a wide range of surgical approaches. Surgery aims for gross total resection of microscopic tumor when anatomically feasible. When complete removal risks neurovascular compromise, the goal should be radical subtotal resection to improve the safety margin between the tumor and critical neural structures to facilitate postoperative radiation. The choice of surgical approach is dictated by the anatomic compartments invaded by tumor, the course of encapsulated or adjacent neurovascular structures, options for reconstruction, and surgeon preference. Given the extradural origin of chordomas, the surgical approach should allow for a primarily extradural corridor for tumor removal, thereby, minimizing contamination of CSF spaces unless mandated by the tumor. Aggressive surgical treatment followed by radiation confers improved long-term disease-free survival in both adults and children with chordoma. In 21.2, we discuss the open transcranial approaches. The transphenoidal approach is considered less invasive, representing the most direct route to the clivus. 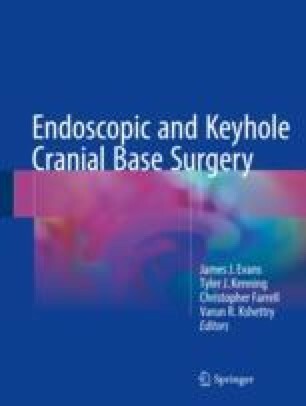 The introduction of endoscopic endonasal techniques, discussed in 21.3, has further reduced the invasiveness of this approach, allowing for a more detailed visualization of the tumor and surrounding neurovascular structures, thus improving the extent of tumor removal and surgical outcomes. However, the long-term outcomes of chordoma management remains somewhat disappointing, with local control rates at 10 years of only 40%.